Click on Play to start. hear Ronald Reagan after file loads =>. 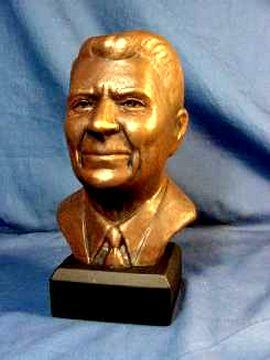 This is a 9" high bust of high fired bisque, hand painted patina. American artist Robert R. Toth pays tribute to the values and contributions of famous political leaders. Ronald Reagan was the 40th President of the United States. An actor turned politician, Ronald Reagan was governor of California and defeated the incumbent Jimmy Carter in the 1980 presidential election. Ronald Reagan's administration was marked by economic recovery, military involvement in Granada, Central America, Lebanon and Libya and improved relations with the Soviet Union. The Berlin wall was torn down during his administration.